The moment Thanksgiving passes, my taste buds shift from pumpkin to peppermint. I blame those delicious peppermint milkshakes from CFA! 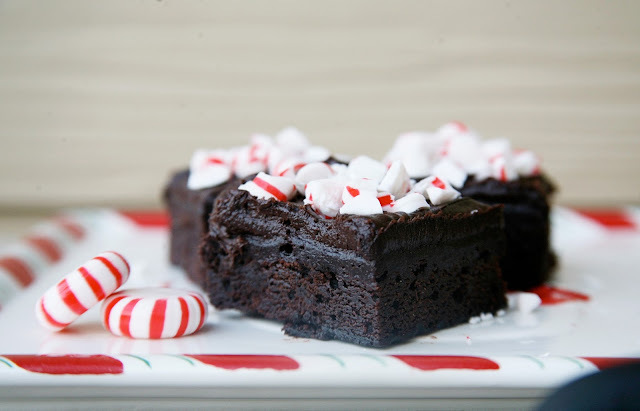 The holidays are filled with tons of yummy treats, but these delicious peppermint brownies usually take center stage here at our gatherings. Sharing the recipe on Savvy Sassy Moms, and currently being selfish by hiding the rest of them way back in the pantry from my sugar consuming family. And for some additional baking fun, it is time to announce our Williams-Sonoma gift card giveaway winner! Rhonda send us an email, and we will be sure to get the gift card out to you as soon as possible so you can start all your yummy baking! Thank you! Bump Update: All is Calm, All is Bright!